Our Church of the Resurrection Family Directory is available for viewing on any web browser once you establish a login. After you click on the hyperlink, you will be asked to enter your email address as it is listed in our directory. 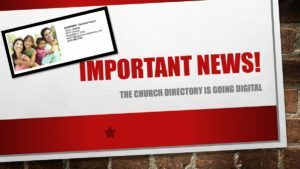 If your email isn’t listed in the directory, contact the church office at directory@churchoftheresurrection.org. The first time you visit the directory site, click on “Create a login now” under the Sign In button. Enter your email address and set up a password to be sent an email confirmation. Click on the link inside that email to confirm your identity and log in with the password you just created. Use your password to log in to the Church of the Resurrection Member Directory. Please take time to reach out to those with whom you share a family of faith. If you have questions, you can follow this link to see step-by-step instructions, or you can contact John Tompsett at jtompsett52@gmail.com or Lynn Meyer at lsmeyer1974@sbcglobal.net.